Chevrolet selects India as an important market to test battery electric technology. General Motors India today showcased the Chevrolet Beat Battery Electric Vehicle (BEV) as part of the ongoing celebrations of World Environment Day. 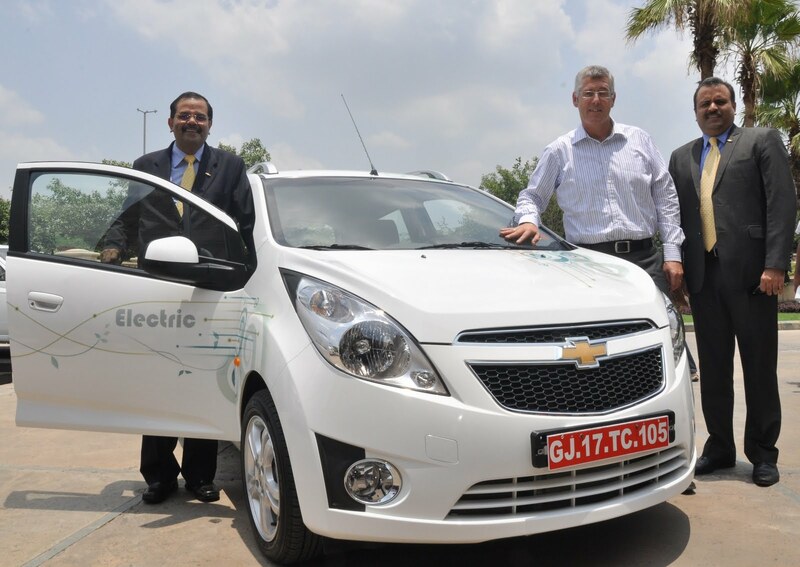 The demonstration vehicle will be used by GM India to showcase the effectiveness of battery electric vehicle technology in India. GM India engineers will also use the vehicle to address potential cost savings to help make BEVs more affordable for global customers. Powered by a 300 cell lithium-ion battery with a total energy capacity of approximately 20 kWh, the 270 kg battery can power the Beat for at least 130 km under normal driving conditions. The liquid cooled battery can operate in temperatures ranging from approximately -20?to 45?, with charge times of less than 8 hours using a 240V outlet. Power from the battery is transferred to the drive wheels through a single speed drive unit and an electric motor producing approximately 45kW of power. This demonstration project is the latest example of GM’s commitment to be a leader in the development of vehicle electrification technologies. GM has already announced demonstration programs in Korea, China and Germany. The company is committed to delivering customers around the world with electrification solutions that best fit their lives, including the industry’s first extended-range electric vehicles: Chevrolet Volt and Opel Ampera. Learnings from this demonstration fleet, and others around the world, will strengthen GM’s core vehicle electrification competencies including batteries, electric motors and power electronic and controls, and charging. GM India is already offering a range of alternate fuel vehicles including Chevrolet Beat LPG, Chevrolet Spark LPG and Chevrolet Aveo CNG to its valued customers. GM has already established battery leadership. It has one of the most advanced battery labs in the world at its Technical Center in Warren, Michigan in the United States and will be opening a new battery lab in China soon. The year 2011 marks the completion of 100 years of Chevrolet’s successful operations globally. With a wide array of products and services, Chevrolet has brought unmatched product quality and unparalleled performance to the customers around the world. Inspirational designs, superior technology and innovative programs have made Chevrolet one of the most-loved and sought after brand worldwide. Continuing its journey, Chevrolet plans to launch several new products and services for the global audience, relevant to the respective markets and customer preferences.